A list of the new recipes introduced with Blood and Madness 2014 patch. 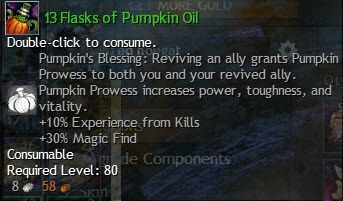 Recipe Purchased from Halloween vendor in Lion’s Arch for 5 Candy Corn Cobs or brought on TP. Can be also obtained from Trick or Treat bags. 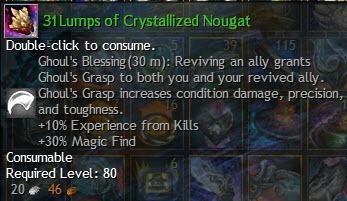 Recipe purchased from the Halloween vendor in Lion’s Arch for 700 Nougat Centers or brought on TP. Can be also obtained from Trick or Treat bags. This recipe is time gated and only one can be made each day. 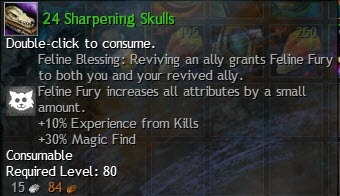 Recipe obtained as a rare drop from Trick or Treat bags or given as one of the possible choices when you first complete Mad King’s Clocktower this year. Also purchasable on TP. 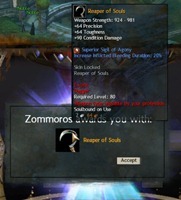 The Mysterious Mystic Forge Recipe has found to be the recipe of Reaper of Souls. Founder was Iris Ng.9845 on the forums. 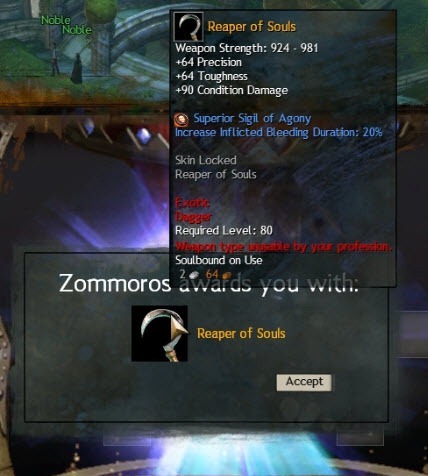 Zommoros let me in on the fact that he expects to have an item he’s never had before to trade with tomorrow. Edit 1: I’ll be checking for discovery and giving hints every once in awhile. First one is free The item has nothing to do with minis. (in story form): Lemark wasn’t much of a haggler. the merchant had taken almost every copper he owned, but it was worth it. He was positive this time, no more fakes, no more copies, forgeries or lies, this was it. He could feel it, sinister…ghostly, it felt weird to hold, but he didn’t care, his journey was one quarter complete. Lemark sprinted down the alleyway, an endeavor likely to leave one examining refuse closer than generally preferable, but this wasn’t his first time. He slowed for a moment to glance behind him, merchants still chasing with guards closely behind them. He was surprised they hadn’t given up, they must be very sensitive about their heritage here, the item itself was a bit too everyday to inspire this kind of rage. “Two more blocks”, he thought to himself, double-checking the sealed, cylindrical case he carried. His attempted thievery had failed, for today, but he wasn’t going to lose what he had to the muddy waters of the bay. Lemark was in high spirits, it had been a productive week. After a series of failures his luck had turned. He stared at his own reflection in the item, such a trivial thing by itself, but with many, there was power. Zomorros knew it as well, Lemark had seen the desire in his eyes before, this was one of his favorites. Out of story hint: I’ve only referenced 2 of the components so far. Lemark sat back against the rocky wall, brackish water rained down from one geyser or another. “What am I even doing here?” he thought for the thousandth time. He was exhausted, bloody and sore. “One of these alien curs is going to kill me before I’m done with this”, he grumbled to himself as he stood up and stretched. He needed a drink, but the day hadn’t grown cold yet, he still had time. His resolve hardened, one more attempt, he stared at yet another dulled blade, one more chance for results…this wasn’t going to be fun. Lemark rested his back against the rocky wall. “Deja vu,” he thought wearily. Even the thought had grown tiresome. Two months he’d been here. Two whole months of combat. He had almost died so often that the novelty was wearing off. “What does it say about a person when your imminent death is an uninteresting topic for pondering,” he thought to himself. He was tired of everything – this place, the clinking noises he made everywhere he went, the shelled beasts, and especially tired of the never-ending bloodshed. He leaned his head back, closed his eyes and tried to imagine being back home. Instead he saw the smug face of Zomorros. He had almost forgotten his hate for the being. It was exactly what he needed – a reminder of why he was here. A slight rumbling forced his attention back to reality as one of the creatures noticed his intrusion. He stared directly at the charging beast. If he had to, he would wipe this entire species off the face of the planet. Lemark stared at his arms, at the half healed wounds that would soon serve as a permanent reminder of his last several months. Despite that he felt invigorated. All of that was behind him. He had gotten further than anyone else before – or so he supposed. The final piece would be the hardest. He doubted he would have to fight some great monster, that wasn’t Zomorros’s style. He would have to do something harder; this journey wouldn’t end in a tremendous final battle. The ending would be more precise, more…scientific. He had only a single clue, contractually obligated from his last deal with the pseudo-deity. He stood up from his table in the heart of Lion’s Arch and turned south. A Sylvari scientist, not what Lemark expected. He should have learned by now that there was nothing ordinary here. Despite the science, this was a nice respite, he could get used to this. Something here was harmonious and relaxing, was that part of the plan? A shriek echo’d all around. Lemark was surprised, he still hadn’t learned. Nothing about this place was ordinary. I’m wondering how to get the endless bottle of batwing brew. Is there a recipe or does it drop? Clue Two: A crystal from Rata Sum (Maybe Snaff Memorial Lab) The reference to the bay makes me believe it is Rata Sum because that is the only port city. Plus, Asurans have a lot of crystals too. Clue Three: I believe it has something to do with Southsun. (Cur is slang for half-bred dogs, so I don’t know if he is hinting to the Skulk or still talking about Karka because he says alien). 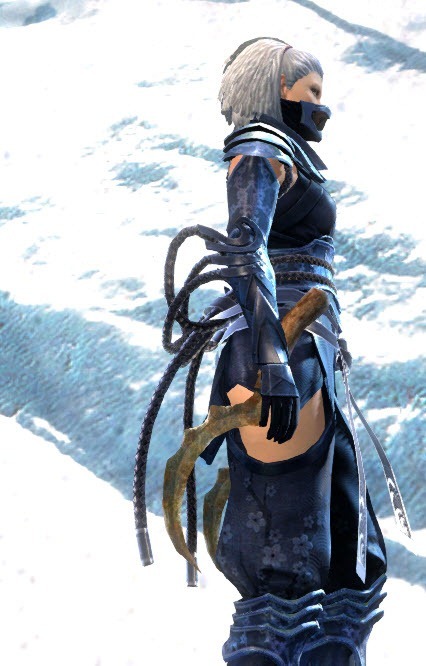 because i always wanted a rusty sickle my thief would be holding the wrong way around and strike with the handle instead of the actual blade, let alone that a rusty sickle is not among the tools i would want my thief carrying around as it doesn’t fit his style one bit. I am not surprised that the item wasn’t actually worth all the mystery they made up for it. Potentially a small sign of what to expect from the coming living story and how it will “delve deep into gw1 lore”. Lookie there, White Mantle, Shining Blade and…Jungle…stuff. yeah. Wow, can’t see any way, shape or form this is worth 100 Powerful Blood and 50 skill points. Looks like Masterwork dagger at best. Move along folks, nothing to see here. Just another gold sink. Collect new items and recipes from horrors within the Mad King’s Labyrinth, and save up Candy Corn to trade in for prizes! This year’s rewards selection has been expanded to include ******new items like a recipe for an Endless Bottle of Batwing Brew******, the Hexed Outfit, and Mini Zuzu, Cat of Darkness. i have put **** in the question area says there is a recipe for the endless tonic.. have not found anything on it at all anywhere sent a question in and still have no gotten anything back….. maybe someone here can answer what is the formula for this endless tonic? From what Dev track say, Maize Balm will be the way to get ToT bags after Halloween. That’s why it is time gated. Transform them in candy corn elemental and farm them. Just have to find the best way to Lair for ambient creatures.